Spa fragrances lightly scent your spa water and will dramatically increase relaxation and therapy during spa use. 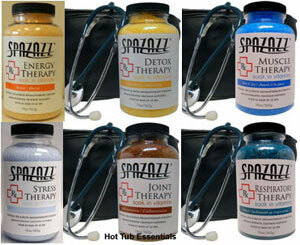 Using scents in your hot tub produces a more pleasing experience and it may also help you with various health problems! Aromatherapy is the use of resources extracted from leaves, flowers, bark, roots, buds, and seeds used to improve your health and how you feel. Fragrances have proven to help with colds, the flu, burns, insomnia, depression, migraines, muscular pain, and stress. You simply add about 1 tablespoon of a specifically designed spa fragrance, like SpaZazz Therapy Crystals to your water and enjoy! Spa fragrances are designed to be used for hot tub applications and will not alter the water chemistry or cloud the water. The scent will last 2 or 3 days, depending on how much you add. View all Spa Fragrances here.